Ready To Publish? Check Out Kindle Scout. Do you have a finished manuscript and are looking to shop it around to publishers? You may want to take a look at Kindle Scout. It’s a new program offered by Amazon for new, unpublished books, and it may earn you a publishing contract with Kindle Press in 45 days or less. Here’s how it works. 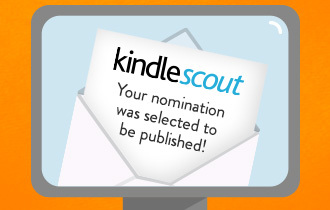 Kindle Scout connects you with readers prior to your book’s publication. If your book is selected for publication by Kindle Press, readers who nominated the book receive an early, free copy and are invited to leave reviews. If your book is not selected, those same readers have the option to be notified when you independently publish through Kindle Direct Publishing (KDP). Guaranteed advance & competitive royalties: A $1,500 advance and 50% eBook royalty rate. Focused formats: Kindle Press acquires worldwide publication rights for eBook and audio formats in all languages. You retain all other rights, including print. 5-year renewable terms: If your book doesn’t earn $25,000 in royalties during the initial 5-year contract term, and any 5-year renewal term after that, you can choose to stop publishing with us. Easy reversions: After two years, rights in any format or language that remain unpublished, or all rights for any book that earns less than $500 in total royalties in the preceding 12-month period, can be reverted upon request–no questions asked. Early downloads & reviews: One week prior to release date, everyone who nominated your book will receive a free, early copy to help build momentum and customer reviews. Amazon marketing: Your book will be enrolled into Kindle Unlimited, the Kindle Owners’ Lending Library, and will be eligible for targeted email campaigns and promotions. To learn more about this opportunity, click here: Kindle Scout. I posted my book, The Light of Supremazia, a few days ago. https://kindlescout.amazon.com/p/1PMYID5KFXEY5 I was trending as hot for a few days! If I don’t win the contest, at least it’s great marketing.